My guild is having a show on the 2nd and 3rd of May. 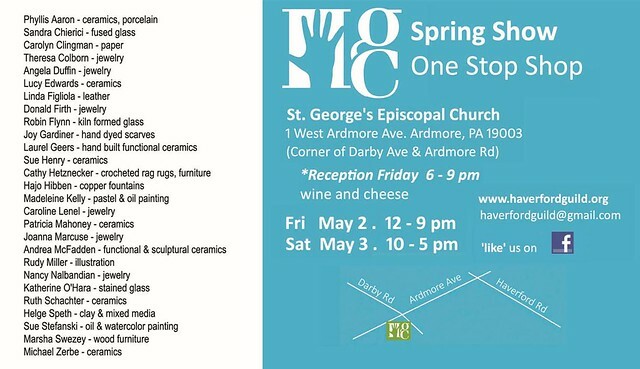 I’m not showing at this event but there will be a wonderful selection of crafts at this show — jewelry, furniture, glass, painting, pottery, sculpture… What a great way to start the Spring season! Maybe you’ll find something fabulous for your home or something for yourself. Chat with the crafters and you’ll definitely spark your own energy and creativity. 28 Apr	This entry was published on April 28, 2014 at 10:20 pm. It’s filed under Events and tagged Crafts, Haverford Guild of Craftsmen, Pennsylvania Guild. Bookmark the permalink. Follow any comments here with the RSS feed for this post.